Your protecting shield over us at the end of this day. from the dark that seeps up the edges. because You are our protecting Warrior. For we know that worry is practicing the absence of Your presence. “Go slow. Be God-struck. Grant grace. Live Truth. 6-7 Don’t fret or worry. Instead of worrying, pray. Let petitions and praises shape your worries into prayers, letting God know your concerns. Before you know it, a sense of God’s wholeness, everything coming together for good, will come and settle you down. 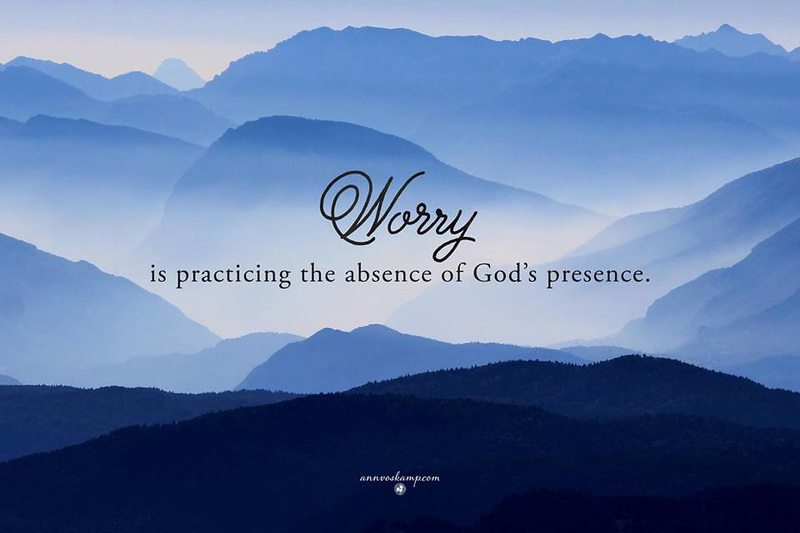 It’s wonderful what happens when Christ displaces worry at the center of your life. 6-7 Don’t worry over anything whatever; tell God every detail of your needs in earnest and thankful prayer, and the peace of God which transcends human understanding, will keep constant guard over your hearts and minds as they rest in Christ Jesus. 6 Don’t worry about anything, but pray about everything. With thankful hearts offer up your prayers and requests to God. 7 Then, because you belong to Christ Jesus, God will bless you with peace that no one can completely understand. And this peace will control the way you think and feel. Do not: worry, fret, be anxious or allow my mind the uneasiness of dwelling on real or imagined or anticipated troubles and difficulties. If worry is practicing the absence of God’s presence which is sheer crazy, false nonsense and I know the truth that God is ever and always present, then knock it off. Quit it. Decide to stop worrying when anxious thoughts creep in and choose to replace it with something far better. Instead: pray. Do it with thanksgiving and praise. Tell God about every thing. Thank Him for all He’s done and will do. Let Him know what I am concerned about. He already knows everything about everything but get it off my chest and out in the open and talk to God all about it anyway. Praise Him. God’s peace which is beyond mine or anybody’s comprehension will guard,keep, and protect my heart and mind through Jesus. His peace will rule what and how I think and feel and do. Thank You, Lord for the truth of Phil 4: 6-7 for me to grab a hold of and apply! This entry was posted in Quotes and Excerpts. Bookmark the permalink. What beautiful truths! Thank you for sharing! Like you, I want to snuggle up in God’s arms and be still. Because He covers us, we can take a deep breath, and just rest in His presence.